This Bookreporter.com Special Newsletter spotlights a book that we know people will be talking about this spring. Read more about it, and enter our Spring Preview Contest by Friday, April 12th at 11:59am ET for a chance to win one of five copies of THE FARM by Joanne Ramos, which releases on May 7th. Please note that each contest is only open for 24 hours, so you will need to act quickly! Nestled in New York’s Hudson Valley is a luxury retreat boasting every amenity: organic meals, personal fitness trainers, daily massages --- and all of it for free. In fact, you’re paid big money to stay here --- more than you’ve ever dreamed of. The catch? For nine months, you cannot leave the grounds, your movements are monitored, and you are cut off from your former life while you dedicate yourself to the task of producing the perfect baby. For someone else. Jane, an immigrant from the Philippines, is in desperate search of a better future when she commits to being a “Host” at Golden Oaks --- or the Farm, as residents call it. But now pregnant, fragile and consumed with worry for her family, Jane is determined to reconnect with her life outside. Yet she cannot leave the Farm, or she will lose the life-changing fee she’ll receive on the delivery of her child. 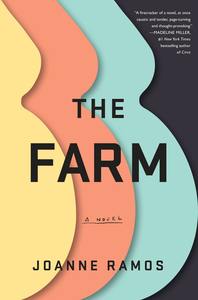 Gripping, provocative and heartbreaking, THE FARM pushes to the extremes our thinking on motherhood, money and merit, and raises crucial questions about the trade-offs women will make to fortify their futures and the futures of those they love. - Click here to connect with Joanne Ramos on Instagram. This is a special newsletter for our Spring Preview Contests, which will mail on select days through April 25th. This newsletter is separate from our weekly Bookreporter.com newsletter, which mails every Friday. You can subscribe to that newsletter here.